On January 24, 1984, Apple Computer Inc.'s chairman Steve Jobs took to the stage of the Apple's annual shareholders meeting in Cupertino, to show off the very first Macintosh personal computer in a live demonstration. Macintosh 128 came bundled with what was later called the Mac OS, but then known simply as the System Software (or System). The original System Software was partially based on the Lisa OS, previously released by Apple for the Lisa computer in 1983, and both OS were directly inspired by Xerox Alto. It is known, that Steve Jobs and a number of Apple engineers visited Xerox PARC (in exchange for Apple stock options) in December 1979, to see Alto's WYSIWYG concept and the mouse-driven graphical user interface, three months after the Lisa and Macintosh projects had begun. The final Lisa and Macintosh operating systems upgraded the concepts of Xerox Alto with menubars, pop-up menus and drag and drop action. 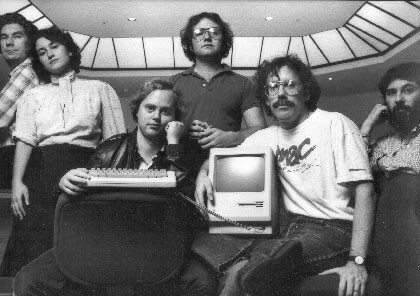 The primary software architect of the Mac OS was Andy Hertzfeld (see the lower photo, he is standing in the middle). He coded much of the original Mac ROM, the kernel, the Macintosh Toolbox and some of the desktop accessories. The icons of the operating system were designed by Susan Kare (the only woman in the lower photo). Macintosh system utilities and Macintosh Finder were coded by Bruce Horn and Steve Capps. Bill Atkinson (the man with the moustache in the lower photo) was creator of the ground-breaking MacPaint application, as well as QuickDraw, the fundamental toolbox that the Mac used for graphics. 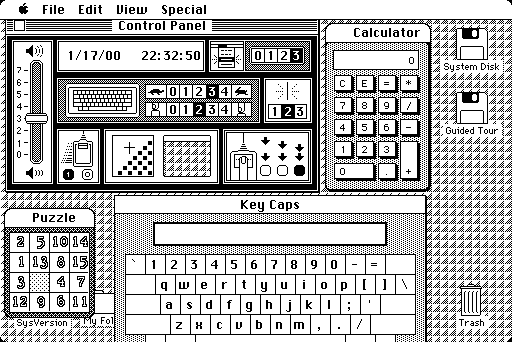 Atkinson also designed and implemented HyperCard, the first popular hypermedia system. Just like his direct rival, the IBM PC, Mac used a system ROM for the key OS code. However, IBM PC used only 8 kB of ROM for its power-on self-test (POST) and basic input/output system (BIOS), while the Mac ROM was significantly larger (64 kB), because it contained both low-level and high-level code. The low-level code was for hardware initialization, diagnostics, drivers, etc. The higher-level Toolbox was a collection of software routines meant for use by applications, quite like a shared library. Toolbox functionality included the following: management of dialog boxes; fonts, icons, pull-down menus, scroll bars, and windows; event handling; text entry and editing; arithmetic and logical operations. The first version of the Mac OS (the System Software, which resided on a single 400KB floppy disk) was easily distinguished between other operating systems then because it does not use a command line interface—it was one of the first operating systems to use an entirely graphical user interface or GUI. Additional to the ROM and system kernel is the Finder, an application used for file management, which also displays the Desktop. The two files were contained in a folder labeled System Folder, which contained other resource files, like a printer driver, needed to interact with the System Software. The first releases were single-user, single-tasking (only run one application at a time), though special application shells such could work around this to some extent. They used a flat file system called Macintosh File System (MFS), all files were stored in a single directory. The Finder provided virtual folders that could be used to organize files in a hierarchical view with nested folders, but these were not visible from any other application and did not actually exist in the file system.